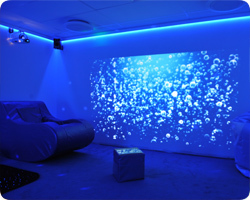 We worked closely with London Gatwick Airport to install a sensory room in their north terminal. The room is designed for customers with autism, dementia, cognitive impairment and other special needs in order to make the airport experience less overwhelming. Gatwick is the first UK airport to install a room of this kind. Doing so has generated a lot of PR for them including a feature on BBC news and in several press publications. 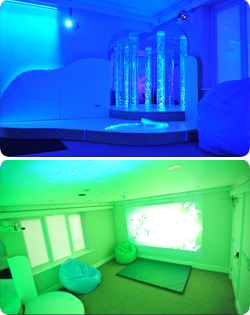 Click Here to find out more Gatwick's Sensory Room project. 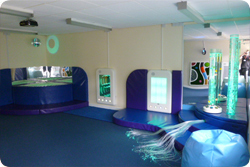 Knowsley Community College approached Rompa in early 2016 to develop a sensory room that met the wide range of needs of the students for a new campus opening September of that year. 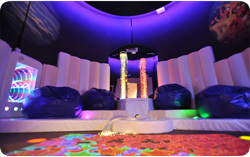 Working together we developed a fantastic Snoezelen Multi-Sensory Environment that is loved by both students and teaching staff. 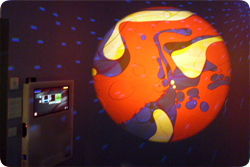 Click Here to find out more about this journey from empty room to Multi-Sensory Environment. "The room is used by profoundly disabled people many of whom do not communicate with others. They come into the sensory room and they are like completely different people. People who are hard to engage and connect with come into the room and come out of their shell." This project consisted of three rooms in Carlisle. 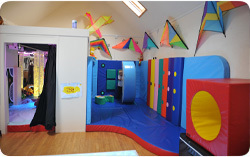 A large soft play and sensory room and a smaller sensory/UV room. 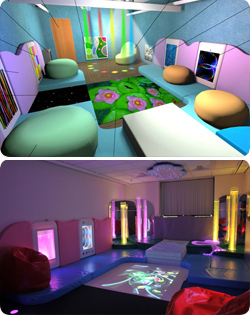 The sensory room included Sensory Magic®, our Interactive Lighting System and Interactive Floor Projection. We also installed a Vibrating Floor . 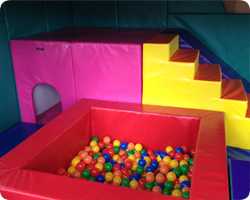 The soft play room included a tiered design consisting of platforms, cabins, steps, tunnels and a bespoke Squeezer Cube it also included an SI area with a suspension system and several swings. 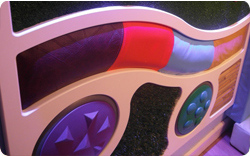 Click Here to see The James Rennie Soft Play and Sensory Room. 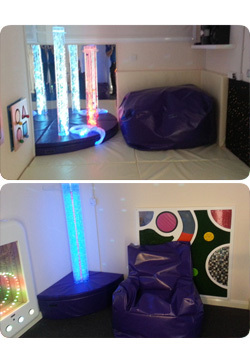 This is a home sensory room created for 3 year old Zach. Zach has severe learning difficulties and Autism, this can make it hard to engage with him. The sensory room has given his parents the opportunity to access Zach's world. 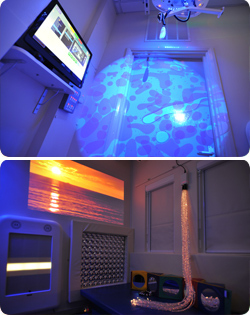 Click Here to see Zach's Sensory Room. "Zach's eye contact has improved vastly and he tracks the products in the sensory room with his eyes. This allows him to communicate and tell us when he wants to switch the bubbles on and off." The Kingswood Children's Centre provide a range of services and activities delivered by qualified and experienced workers. Their setting provides a safe and stimulating environment where children can experience a range of activities, which encourage play and exploration. Click Here to see the Kingswood Children's Centre gallery. Advent House is a two storey building, purpose built, to provide 24 hour accommodation and nursing care for up to eight people with learning disabilities. The property is accessible for people with learning disabilities who may also need to use a wheelchair. Click Here to see the Advent House gallery. "The feedback we have received is of admiration for the room and its equipment, not solely from the people who use it but from the support workers, families of service users, commissioners, people who come to do training at the service and the people who regulate us, the C.Q.C." Longley Meadows is a 9 bed respite care unit for people with a learning disability and complex needs. Set in the grounds of Sheffield's Northern General Hospital, recent refurbishment has added specialist furniture, a prayer room and new sensory room to this facility. Click Here to see the Longley Meadows gallery. Fiona Gardens is part of the Trafford Housing Trust which manages and provides over 9,000 homes for people across Trafford, including homes and services for older and more vulnerable people. Click Here to see the Fiona Gardens gallery. Levick Court cares for people from 18 to the elderly with a wide range of disabilities and additional needs. The Home is divided into two units, one for people requiring residential care the other for people requiring respite care. 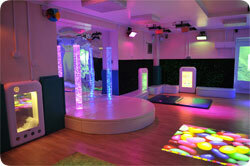 As well as a state of the art Rompa sensory room Levick Court has communal lounges and dining areas. Click Here to see the Levick Court gallery. Francis House has been bringing a ray of sunshine into the lives of countless sick children over the last two decades. The hospice provides end of life care and respite for children and young people with life threatening conditions. As well as a state of the art Rompa sensory room, Francis House has a Jacuzzi, soft play room, family lounge, music and aromatherapy rooms, kitchen, dining area, gardens and outside play area. Click Here to see the Francis House gallery. 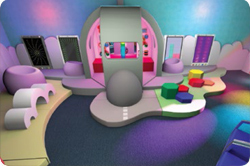 We want you to be delighted with your sensory room, that's why when you invite Rompa to design your sensory environment you can be sure that we will bring our 3 decades of experience, design flair and installation expertise to your project. Whether money is no object or your budget is more modest, our desire for customer satisfaction remains the same. Click Here to see what we can do with a more modest budget. Easington Colliery Primary School strive to bring the best out in every child across the curriculum, giving the children a wide range of opportunities both academic and extra curricular. Broomlands Primary School and Early Years provide a welcome, happy, caring environment where every child is given the opportunity to achieve his or her own potential through a quality education. Springwood Primary School wanted an area to cover to all sensory requirements with equipment to provide tactile, visual, auditory, olfactory, vestibular & proprioceptive feedback but with a special focus on education. 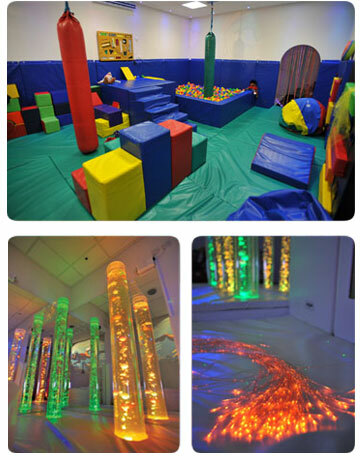 The space will also be available to parents who want to spend time in the sensory environment with their children. With areas for crafts, dressing up, a quiet reading area, a music area, a fully equipped state-of-the-art multi-sensory room for relaxation, a fully functioning kitchen for life-skills teaching, and an incredible outdoor play space, Heathlands Village Children's Centre has everything a child of any age could need. It is beautifully decorated with lots of bright, vivid murals and is an ideal, safe venue for children. Ammanford Nursery School is in Carmanthanshire, Wales, and provides early years care and education to children from six weeks old to school age. "We would highly recommend Rompa to other schools and businesses. Workers were very polite, hard working and delivered a very good service." The Alan Shearer Specialist Residential home is specifically designed and staffed to serve the complex needs of adults with disabilities and challenging behaviours. Using a person-centred approach, they provide a safe and nurturing setting where disabled residents have free and full use of all the leisure, therapeutic and learning facilities. "Really impressed with the Lilac Room. Excellent use of the space available and the equipment and sensory items are fantastic. Nicole enjoyed the comfort of the new Lilac Room. Andrew loved the music, Edward loved it all. Dan says it's brilliant – especially the water bed!" The new facility provides a much needed break for families and a chance to enjoy new activities for children and young people who require specialist equipment, manual handling or who have complex health needs. "I received lots of telephone calls and emails keeping me informed. Very methodical site survey, great engineers. 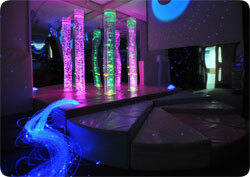 The sensory room looks even better than the picture and what we imagined. We are absolutely delighted with the room and the difference it will make to our young people. Thank you so much!" The Percy Hedley Foundation is a registered charity that provides services for disabled people and their families. The SLT team plan and implement sensory sessions that provide service users opportunities to explore, interact and experience the world around them at their own pace. They came to Rompa after a recommendation. "All your staff I have come into contact with have been very helpful & friendly be it on the telephone, email or face to face." 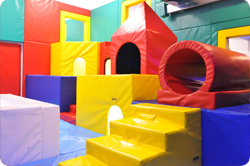 A project that became known affectionally and simply as "Tom's Room" was a soft play area with an adjoining sensory room for two brothers in Southampton. The design was fully customised for Tom and the family’s needs. Click Here to read the blog entry. Westleigh Resouce Centre is based in Strawberry House, Lorton Road, Cockermouth. We were delighted to take on this project and we're sure that Westleigh's new Sensory Room will bring delight to all those who use it. Rompa are very proud to have been involved in helping BBC Children in Need as part of a BBC 1 special programme: “DIY SOS: The Big Build”. 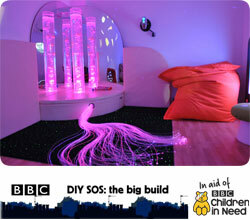 The programme featured the renovation of a centre for children with additional needs in Edinburgh. The Yard helps children and young people from 3 to 25. It is an indoor and outdoor space that welcomes the whole family. This year the centre celebrates 25 years of helping families deal with the demands of daily life, giving the young people a space to develop their confidence and encouraging them to make lasting friendships. The Yard receives a grant towards its costs from BBC Children in Need, but the building and its outdoor space were in desperate need of a total overhaul. 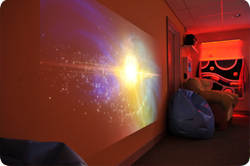 Rompa donated a state of the art Sensory Room to BBC Children in Need that can aid relaxation or stimulation according to the users needs. Cwm Golau Integrated Children's Centre (ICC) officially opened in July 2005, the Centre in Pentrebach, is a ‘one stop shop’ where families can access a range of services including childcare, pre-school learning, family support, health promotion and community training. 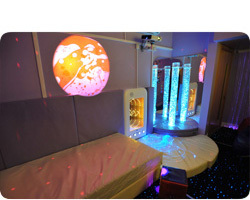 The sensory room, designed with the help of our local parent forum Voice4Parents, provides relaxation, fun and play for children and young people with additional needs and their families. 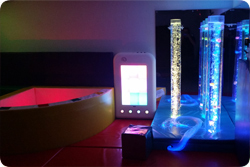 Sensory experiences are created through projected images, bubble tubes, sound and lighting, tactile objects and a wide range of interactive games that create a magical atmosphere for all. 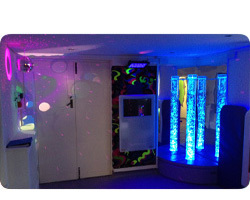 The Sensory Room is located at the recently refurbished Brickkiln Community Centre, off Great Brickkiln Street, Cherry Street, Pennfields, Wolverhampton, WV3 0QW. The Centre also has a fully accessible ICT Suite with adjustable desks suitable for wheelchairs, internet access and printing facilities. There are fully accessible changing facilities with height adjustable beds and portable hoist. 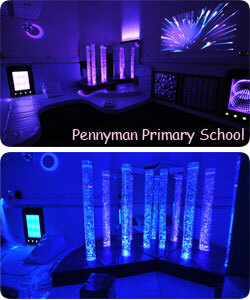 Pennyman Primary School in Middlesbrough approached Rompa looking for our expertise to help guide them with the development of a big Sensory project. 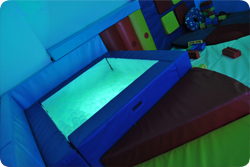 They were planning to convert an unused hydrotherapy area into a Snoezelen environment which could help many children with a wide range of Special Educational Needs, but did not know where to start or what could be done with the unusual shaped room. After an initial consultation with the Head of the school, the team at Rompa got together and came up with some initial ideas based on the facts that had come out. Gemma Cooke, the designer at Rompa translated their comments into a stunning design which was shown to Pennyman in a detailed 3D graphic design. It was clear however that something wasn’t quite right and that the staff, children and community wanted more for their room. Click Here read the full story. From a simple meeting with Derbyshire County Council many years ago the foundations were laid for this groundbreaking project. 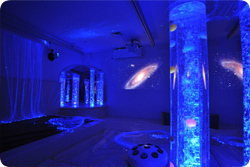 This unique programme is conducted in a ‘Magic Room’ and a ‘Rainbow Room’ with Snoezelen facilities and principles. It’s main objective is using structured play and activities designed to raise the feeling of self worth for children and young people, from those with autism, aspergers syndrome, low self esteem to those with challenging behaviours. Fast forward 10 years and our partnership continues to this day from developing new resources and kits to creating new sensory environments all aimed at improving children’s emotional and behavioural well being. We are proud to be part of this success story. In 2011 we were approached by Hopscotch Children’s Therapy Centre in Harley Street, London to partner and help support them in an exciting a new project called Starjumpz in Tunbridge Wells. 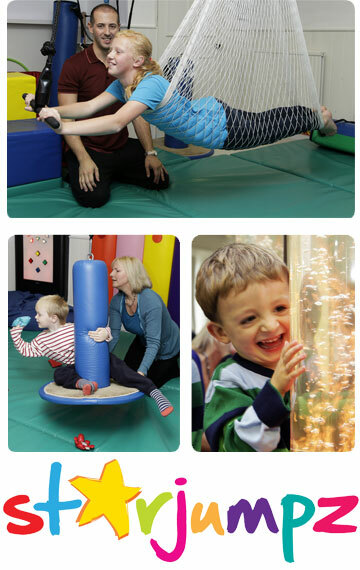 Hopscotch is a multi-disciplinary team of occupational therapists who specialise in Sensory Integration (SI). They provide in-depth assessment, indivdualised therapy and treatment to children from all over the world to improved their motor skills and organisation of behavior. They are one of the countries leading providers of SI therapy. 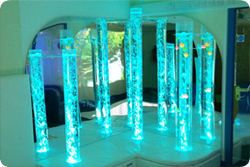 Starjumpz principles centre around incorporating parts of traditional SI therapy into a Snoezelen MSE approach. The results have been exceptional. What makes Starjumpz so important is their holistic approach to child therapy. They provide comprehensive assessments, reports, therapy, and insets on behalf of children with a range of disabilities including dyspraxia, autism, sensory integration, adhd and allied conditions. Their team consists of experienced paediatric occupational therapists and speech and language therapists who provides training and educational programmes for parents, teachers and health professionals primarily on Sensory Processing Difficulties and Therapy. We are proud to continue our partnership with Hopscotch and Starjumpz in providing all their equipment from swings, to sensory rooms to soft play areas. Click Here for contact details and to see the gallery. To find out more or to make an appointment to visit these innovative centres please contact us.